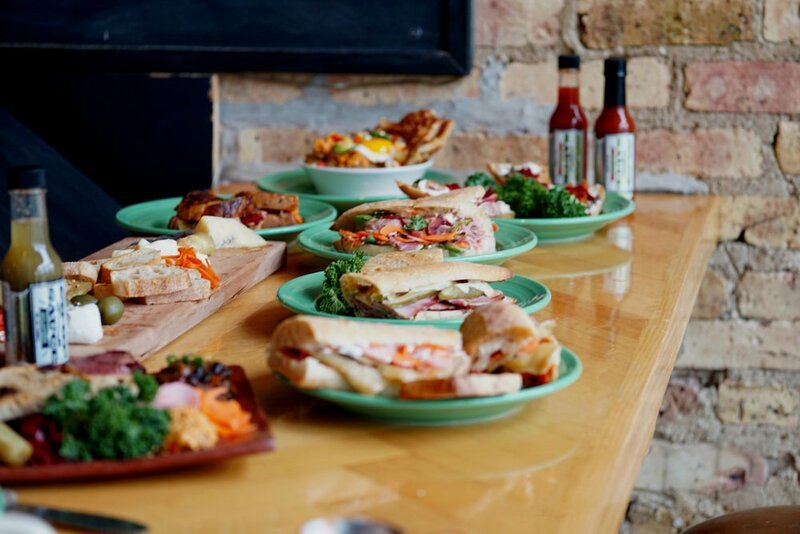 (Sauce and Bread Kitchen)has been the bricks and mortar amalgam of two beloved Chi-Town food forces: social enterprise Co-op Sauce (Mike Bancroft) and bread/pastry makers extraordinaire Crumb Chicago (Anne Kostroski). Like Voltron they joined for greater awesomeness and simply named themselves after what they do best (Sauce and Bread Kitchen). We like to share about all of the things, this is where we do that. That Toast Though - Crumb breads toasted, House ricotta/preserves, smoked salt. Munchy Granola Bowl - our very own House granola with preserves, and Yogurt. Dark Matter Coffee - The Sauce is a custom medium dark roasted blend made specifically for our menu by our friends at Dark Matter. Only available at Sauce and Bread Kitchen. Used for both our nitro and drip coffee service. House Soda - Seasonal: sometimes foraged, always delicious. BYOV Bloody Mark - We make our own mix and have all of the: hot Co-op Sauce, pickles, cheesy bites, and charcuterie nibbles for a skewer to behold. Why wouldn’t we have a BYOV Bloody Mary is the question? Oven Roasted Turkey Hoagie -  turkey, crisped house ham, smoked carrot, feta spread on baguette. Cubano - Say hello to our house cured ham, melty cheese, sour pickle, and poblano mustard nuzzled in a baguette. Big Brassi Salad - not quite slaw, not quite sauerkraut it’s served with crunchy things on top, and dressed to order. Pastries - Are The Bomb! No seriously they are really, really good. 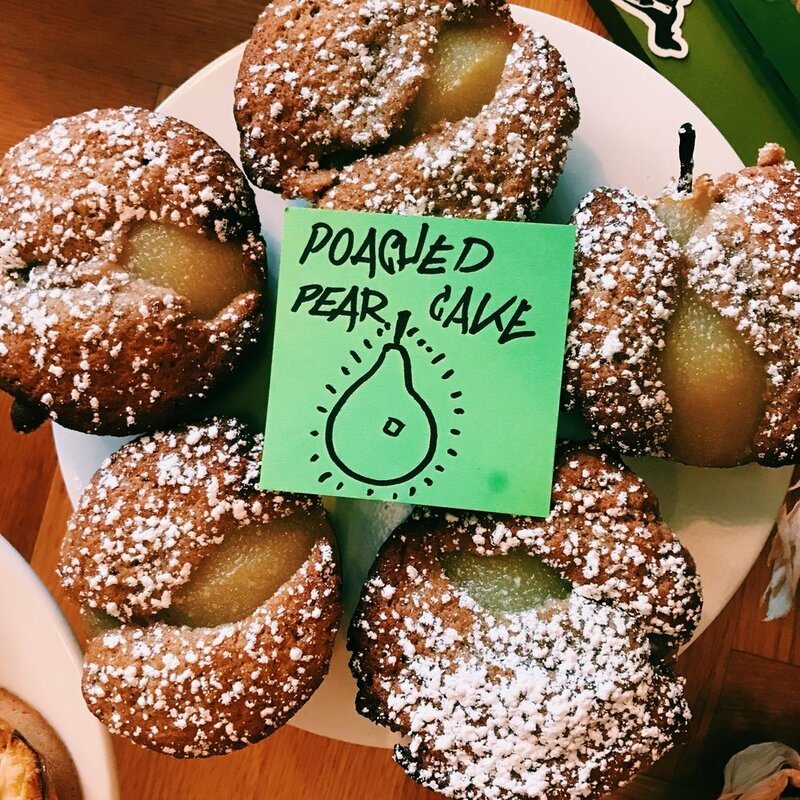 We have a rotating cast of some of Chicago’s most delicious pastries. From croissants to our classic tahini-chocolate chip cookie. Bread - It’s in the name. We are the ONLY location in the city to purchase the famed Crumb Bread. Sauce - Co-op Sauce is made right here in the confines of SBK so you might imagine we have the best selection of hot sauce in Chicago. Daily Specials - Change Daily we like to keep it weirdly delicious. House made everything from Chef Anne Kostroski’s pastry and bread to the Sauce Boss, Mike Bancroft’s fermental foods and charcuterie. We celebrate our Midwestern purveyors with every bite and take pride in sharing the stories of these relationships through our menu.